The boys arrived at the white gates at the respectable hour of 7am, fully kitted out in their new tour training gear, excited by the prospect of 6 days of football in Lisbon. A pain free journey to Stansted meant there was a bit of time to kill at the airport but this was not a problem for many. JD Sports, Currys, Starbucks and the Duty Free shop kept many occupied whilst we waited for our flight. We touched down in Lisbon at approximately 2:30pm and met our rep Jose who after just half a day has proven to be excellent at his job. 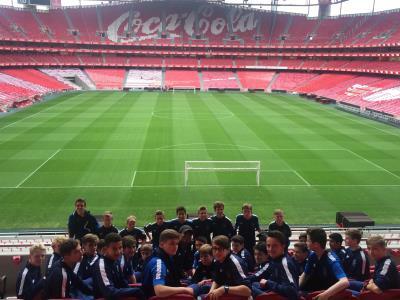 Although the boys were expecting to play their first match this evening, the revamped schedule saw us heading to the Estadio de Luz (home of Benfica FC) for our stadium tour. This was a great experience for the boys as they will be coming back here Sunday afternoon, where all 65,000 seats will be full, for the biggest derby in Portugal (Benfica v Sporting Lisbon). It is going to be special. A quick visit to the shop and then we were back on the bus, heading back to the hotel for dinner. An early night was needed after a long day and tomorrow we have an early start as we play Benfica Soccer Schools in our first match on tour.